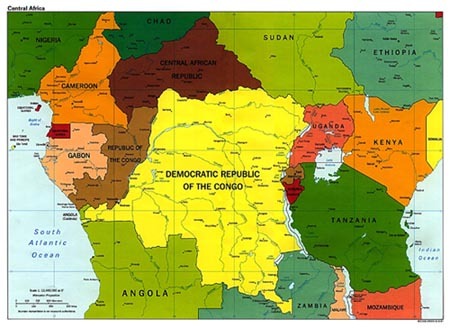 BACKGROUND REPORT (NFTF.org) -- Updated July 14, 2003 -- The Democratic Republic of Congo (DRC) is the current incarnation of a nation that has been known to history by various names although most of us will have known it as Belgian Congo or Zaire. It is still known in some circles as Congo-Kinshasa to distinguish it from its neighbor, Republic of Congo, or Congo-Brazzaville. Much of its western border is comprised of the Congo River which it shares with Republic of Congo in an undefined way; no specific agreements have been reached on the division of the river, its islands, or its resources. This nation of approximately 55 million is in Central Africa surrounded by Republic of Congo, Central African Republic, Sudan, Uganda, Rwanda and Burundi, Tanzania, Zambia, and Angola. There are over 200 ethnic groups in DRC but about 45% of its population consists of three groups who are Bantu, and a fourth that is Hamitic. Author Joseph Conrad referred to this area as the "Heart of Darkness" and it is this area that is known to many as "darkest Africa." DRC is a nation endowed with vast potential wealth (gold, diamonds, rubber, copper, cobalt, oil, timber, and coltan along with a wide variety of agricultural produce) but its economy has declined significantly since the mid-1980's due a variety of unsuccessful government measures, the residue of colonial rule, and the financial imperialism of new masters. It has been estimated that DRC may comprise the most mineral-rich chunk of land on the globe but its recent history has been one of internal conflict. Much of this arose as the nation absorbed large numbers of refugees from the fighting in Rwanda and Burundi in 1994. But the conflicts in the whole region of central Africa really date back as far as the fifteenth century and are today, as they always have been, conflicts of imperialism. Many of the countries in this area achieved independence from colonial masters in the 1950's and 1960's and quickly degenerated into fighting within and without their borders, much of it spurred by the "financial colonialists" who stepped into the gap left by the old monarchies. The history of these nations since the fifteenth century has been one of European colonialism, resistance, independence, followed by neocolonialism, and prolonged resistance yet again. The primary beneficiary of the new order in this region was the United States who allegedly maneuvered the assassination of Congo's first president, Patrice Lamumba, in 1960. The country's history has been troubled ever since. President Joseph Mobutu ruled for over 30 years after coming to power in a CIA-aided coup. He is said to have turned over and again to policies and practices that would favor United States government and business interests over the needs and interests of his people. But rebel groups arose to challenge Mobutu's rule and in 1997, power was seized by Laurent Kabila, a former Marxist who led the Alliance of Democratic Forces. During most of Mobutu's rule the country had been known as Zaire but in May 1997 Kabila formally changed its name to Democratic Republic of the Congo. On assumption of power, Kabila inherited a country already involved in massive tribal infighting, partly arising because of the influx of refugees in 1994. His rule was quickly challenged by a Rwanda and Uganda backed rebellion in August 1998. Finally, troops from Zimbabwe, Chad, Angola, Namibia, and Sudan intervened to support Kabila's government. Even though a cease-fire was reached in July 1999 between DRC, Zimbabwe, Angola, Uganda, Namibia, Rwanda and the Congolese rebels, sporadic fighting continued unabated. Kabila was assassinated January 16, 2001, again with alleged CIA intervention, and rule of the country fell to his son, Joseph. Joseph Kabila was successful in negotiating a withdrawal of the Rwandan forces from Congo in October 2002, and early in 2003 all combatant parties finally came to the table and agreed to cease the fighting. They agreed to set up a government of national unity as a caretaker until democratic elections can be held in 2005. These will be the first democratic votes cast in this country in over forty years. Since the departure of the last of the foreign forces from DRC at the end of April 2003, there has been a steady increase in ethnic violence in areas where it is alleged Rwanda and Uganda deliberately incited longstanding ethnic hatred. The violence became so acute that the United Nations finally decided to intervene and has sanctioned a small international peacekeeping force under the direction of France. Local people and area governments appear united in their complaints that the force is too small, that its mandate is too limited and of too short a duration; much criticism has been leveled at the U.N. for its shortsightedness and many people point to this region as having the potential for any genocidal nightmare like that in Rwanda in 1994. As of this writing, the peace agreement reached in April is generally holding and the government is beginning its drive toward restoring the infrastructure and social systems of DRC. The nation lost between 3.3 and 4.7 million people (apparently a difficult number to quantify in these remote conditions) as a result of the past five years of fighting. At this point, they are anxious to get back on their feet, without the shackles of colonialism.